La Mort de Louis XIV, directed by Albert Serra with Jean-Pierre Leaud, Patrick D’Assumcao, Marc Susini, Irene Silvagni, Bernard Belin, and Jacques Henric. Capricci Production, 112 minutes. The agony of Louis XIV starts on August 9th 1715, and lasts until September 1st. It marks the end of a personal reign that lasted 72 years—the longest in French history. The of official diary of the Health of the King, which was held by its successive doctors, reveal that Louis XIV had a fragile health and almost died on numerous occasions: from syphilis at the age of five, from a maligned fever at thirty-five, from a fistula at forty-five, and from diabetes with gangrene complications at seventy. This time, at the start of August 1715, Louis XIV suffers from an embolism in his leg due to cardiac arrhythmia, which will start the gangrene. The good news is that The Death of Louis XIV (La Mort de Louis XIV) isn’t only the ultra-arthouse director’s first feature in which he works with professional actors instead of amateurs, but it’s also by far Serra’s most accessible work to date. Buyers and programmers familiar with the auteur will of course understand this hardly puts the film, essentially a death-chamber piece, in Avengers territory, though commercial prospects are certainly better than usual. The film’s only exterior sequence comes at the very start, as the 76-year-old Louis XIV (French New Wave legend Jean-Pierre Leaud) surveys his famous gardens at Versailles, which were partially constructed during his 72-year reign. He’s in a proto-wheelchair because his leg already hurts and it certainly can’t be a coincidence that the monarch’s overlooking his estate in the twilight hours before retiring to the palace, a place he’ll only leave again a fortnight later, a dead man. For almost the entire film that follows, Serra keeps the viewers inside the king’s bedroom, with practically no expeditions to even the adjacent room and corridors. The claustrophobic setting within what viewers presumably know is a vast expanse of real estate (which in turn was a tiny fleck of property within the Kingdom of France), is clearly meant to humanize the man who believed he ruled France by divine right but who, in his waning days and hours, looked just like millions of others on their deathbed. . .
With the UK release of Mike Leigh’s Mr Turner, the Turner House Trust hopes to raise the profile of the painter’s house in Twickenham, which badly needs restoration. From the press release (14 October 2014) . . . There cannot be many people who are unaware of the imminent general release of Mike Leigh’s award-winning Mr Turner, the biographical film of one of the supreme masters of landscape, England’s JMW Turner. What is less widely known is that Turner might have pursued a different career as an architect and that he designed and built a country villa for use by himself and his father. Completed in 1813, Sandycombe Lodge near the Thames between Richmond and Twickenham, was Turner’s retreat to escape the hectic London art world and the hurly-burly of his own household. Note (added 7 January 2016) — An update on the project is available here: Farah Nayerijan, “An Effort to Save J.M.W. Turner’s Country House,” The New York Times (4 January 2016). Frederick Wiseman’s new documentary from Zipporah Films has its US premier in New York this month at Film Forum (November 5–18), with the director himself appearing at several of the early screenings (November 5, 7, and 8). The DVD release is scheduled for early 2015. Frederick Wiseman, National Gallery (Zipporah Films, 2014), 181 minutes. London’s National Gallery, one of the world’s foremost art institutions, is itself portrayed as a brilliant work of art in this, Frederick Wiseman’s 39th documentary and counting. Wiseman listens raptly as a panoply of docents decode the great canvases of Da Vinci, Rembrandt, and Turner; he visits with the museum’s restorers as they use magnifying glasses, tiny eye-droppers, scalpels, and Q-tips to repair an infinitesimal chip; he attends administrative meetings in which senior executives do (polite) battle with younger ones who want the museum to become less stodgy and more welcoming to a larger cross-section of the public. 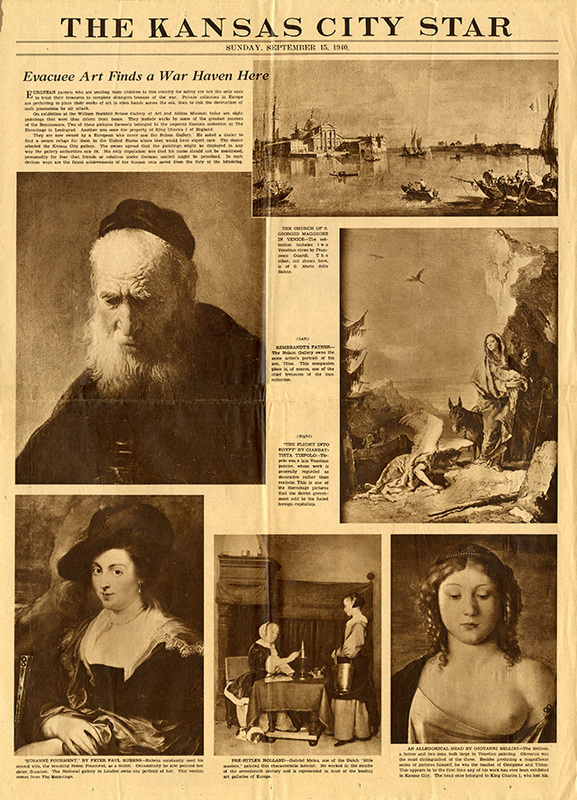 But most of all, we experience the joy of spending time with the aforementioned masters as well as Vermeer and Caravaggio, Titian and Velázquez, Pissarro, and Rubens and listen to the connoisseurs who discourse upon the aesthetic, historical, religious, and psychological underpinnings of these masterpieces. More information is available from the Toronto International Film Festival (TIFF). The BBC has unveiled full details of Eighteenth-Century Britain: Majesty, Music and Mischief, a major new season exploring the extraordinary transformation that took place across the arts throughout the 18th century. The season will include programming on BBC Two, BBC Four and BBC Radio 3 in April 2014. Among the offerings is the new television series by Lucy Worsley, chief curator of Historic Royal Palaces. The first episode is scheduled to be screened at the Oxford Literary Festival, on Monday, 24 March, at 4pm (with the ASECS conference in Williamsburg just a week away, Worsley should be particularly interesting to readers interested in the possibilities of historical re-enactment). 2014 marks the 300th anniversary of the Hanoverian succession to the British throne. To mark the occasion, the BBC and Royal Collection Trust are embarking on a unique partnership—encompassing a three-part series presented by Dr Lucy Worsley for BBC Four, and an exhibition at The Queen’s Gallery, Buckingham Palace. The First Georgians: The German Kings Who Made Britain (w/t), will present the revealing and surprising story of Britain in the reigns of George I and George II (1714–60)—the age of the ‘German Georges’. In 1714, Britain imported a new German royal family from Hanover, headed by Georg Ludwig (aka George I)—an uncharismatic, middle-aged man with a limited grasp of English. Lucy Worsley will reveal how this unlikely new dynasty secured the throne—and how they kept it. An intimate and close-up portrait of these German kings of Britain, the series will follow George I, his son George II, and their feuding family as they slowly established themselves in their adopted kingdom, despite ongoing threats from invading Jacobites and a lukewarm initial response from the British public. Lucy will show how what was happening at court intersected with enormous changes that were reshaping Britain. The years 1714–60 felt like a ‘peculiar experiment in the future’: modern cabinet government began under the Hanoverian kings, satire spoke the truth to power, and ‘liberty’ was the watchword of the age. Lucy will travel to Hanover to discover that the politics and dynastic squabbles, which defined the reigns of George I and George II, frequently had a continental backstory. And she will unravel the central paradox of the German Georges: it was their weaknesses—the infighting between king and Prince of Wales, and their frequent absences in Hanover—that, in a very real way, helped to secure the dynasty and shape our modern British political system. The First Georgians: The German Kings Who Made Britain (w/t) is being produced in partnership with Royal Collection Trust, to coincide with the exhibition The First Georgians: Art & Monarchy 1714–1760 at The Queen’s Gallery, Buckingham Palace from 11 April to 12 October 2014. Curated by Desmond Shawe-Taylor, Surveyor of The Queen’s Pictures, the exhibition is the first to explore the reigns of George 1 and George II, shedding light on the role of this new dynasty in the transformation of political, intellectual and cultural life. Through over 300 works from the Royal Collection collected or commissioned by the Georgian royal family, it tells the story of Britain’s emergence as the world’s most liberal, commercial and cosmopolitan society, embracing freedom of expression and the unfettered exchange of ideas. Lucy will discover the personal side of the early Georgians through the spectacular paintings, drawings and furniture on display in the exhibition. With Royal Collection Trust curators, she will see how objects in the Collection reveal Britain at the very moment it was becoming the modern country we know today. As excitement builds for the release of the Sony film The Monuments Men, The Nelson-Atkins Museum of Art applauds six real-life Monuments Men who either worked in or closely with the museum. Monuments men and women, commissioned by Franklin D. Roosevelt during World War II, were tasked with the protection, recovery, and preservation of millions of Europe’s masterpieces during the Nazi occupation. A display of archival materials will be on view in Bloch Lobby that includes postcards, manuscripts, newspaper clippings, and biographies of the Nelson-Atkins’ Monuments Men. The Nelson-Atkins Museum of Art, Kansas City. Langdon Warner served as the Asian art advisor to the Trustees of the Nelson-Atkins in 1930 and was a close colleague of Sickman. He helped found the American Defense-Harvard Group, a precursor of the Roberts Commission, Roosevelt’s task force. James A. Reeds served with the Monuments, Fine Arts and Archives section in France in 1944. He taught linguistics at University of Missouri at Kansas City and served as a docent for the Nelson-Atkins. The Kansas City Star (Sunday, 15 September 1940). One of the finest examples of 18th-century portraiture at the Nelson-Atkins, Nicolas de Largillière’s Augustus the Strong, Elector of Saxony and King of Poland, was found by the Monuments Men in a bomb-rigged salt mine in Alt Aussee, Austria and returned to Clarice de Rothschild, whose family owned the painting. It was purchased by the Nelson-Atkins in 1954 after Rothschild sold it to an art dealer in New York. During World War II, the Nelson-Atkins also served as a safe house for more than 150 paintings and tapestries from collections on the East and West coasts. The Monuments Men, starring George Clooney and Matt Damon, will be released nationally on February 7. The film is based on the book The Monuments Men: Allied Heroes, Nazi Thieves and the Greatest Treasure Hunt in History by Robert M. Edsel, who continued his investigation into the soldiers who rescued cultural treasures in Saving Italy. The latter book discusses the heroism of former Nelson-Atkins director Paul Gardner. Edsel has created the Monuments Men Foundation for the Preservation of Art, which honors the legacy of the Monuments Men. For more information, visit monumentsmenfoundation.org. Tom Mashberg, “Not All Monuments Men Were Men,” The New York Times (29 January 2014). The art-hunting team, officially known as the Monuments, Fine Arts and Archives Section, grew to more than 300 people in the postwar years. The women never numbered more than a few dozen, but, like the men, they were dedicated scholars and at times notable heroes. Rose Valland, whose role is depicted briefly by Cate Blanchett in the film, was a French Resistance operative who spied on the Nazis and showed herself able to shoot and drink with the boys. Edith A. Standen was a captain in the Women’s Army Corps who went on to a career at the Metropolitan Museum of Art [serving as curator of textiles from 1940 to 1970]. And Ms. Hall was a Smith College graduate who came to the task from a career focused on the study of Asian art. . . .
From Jamie Doward’s article for The Observer (12 January 2014) . . . Directed by Amma Asante, who . . . was born in Britain but lives in the Netherlands, the film tells the story of Dido Elizabeth Belle, the daughter of an enslaved mother in the Caribbean, who went on to live at Kenwood House in north London under the protection of Lord Mansfield, the lord chief justice. While she was living there, in 1772, Mansfield ruled that a master could not carry a slave out of Britain by force, a judgment seen as a crucial step towards the abolition of slavery. Inspired by, though not based upon, Per Olov Enquist’s 1999 novel The Visit of the Royal Physician, A Royal Affair (En kongelig affære) brings the eighteenth-century Danish court to cinema screens this summer. As noted at Screen Daily (19 May 2011), much of this $8million film was shot in the Czech Republic. For more information, consult the film’s website. 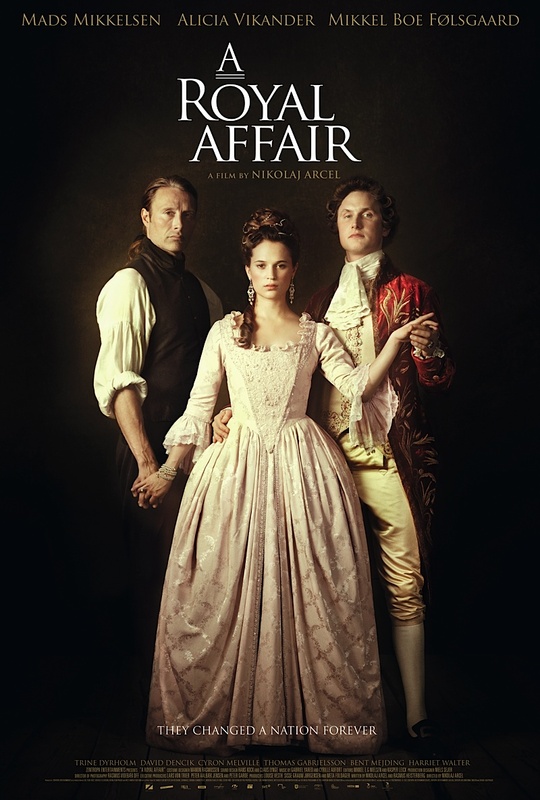 Winner of the Best Actor and Best Screenplay awards at the Berlin Film Festival, and written and directed by Nikolaj Arcel (co-writer of The Girl with the Dragon Tattoo), A Royal Affair is an epic tale of a passionate and forbidden romance that changed an entire nation. Denmark, 1766, and Caroline Mathilde is married to the mad and politically ineffectual King Christian VII. Ignored by the wild King who chooses to live scandalously, Caroline grows accustomed to a quiet existence in oppressed Copenhagen. When the King returns from a tour of Europe accompanied by Struensee, his new personal physician, Queen Caroline finds an unexpected ally within the kingdom. The attraction between the two is initially one of shared ideals and philosophy, but it soon turns into a passionate and clandestine affair. Committed to the ideals of the Enlightenment that are banned in Denmark, Struensee convinces the King to assert his previously untapped power to remove the conservative political council and implement drastic changes to Danish society. As the Court plot their return to power and the downfall of the Queen and Struensee, the consequences of their affair are made clear and the entire nation will be changed forever. A Royal Affair is based on one of the most dramatic events in Danish and indeed European history; whenever I used to pitch the film to foreign investors, people had a hard time believing that the story was true, that these momentous events had actually happened in the late 1700s. In Denmark however, it is taught in school, more than 15 books have been written about it (both factual and fictional) and there has even been an opera and a ballet. I feel honored and extremely lucky to finally bring the full story to the screen. Tonally, I was inspired by the great epics from the 40s and 50s where films would often feel like literary works, structured around characters and the passage of time, and not clearly following the obvious screenplay roadmaps. But my creative team and I were also fired up by the idea of bringing the Scandinavian historical drama into the new century. We wanted to achieve this by adhering to a self imposed rule; we didn’t want to ‘show’ history, didn’t want to dwell pointlessly on the big official events, the fancy dresses and hairdos, or the way the food was served. Rather, we wanted people to simply experience the story through the eyes of the characters, taking the 1760s for granted. Even though the period is obviously there in the set designs, the costumes (Mikkel Foelsgaard who plays King Christian still insists our tagline should have been ‘Big emotions, Big wigs’), it was filmed and edited as we would have filmed and edited a film taking place in modern Copenhagen. Finally, Gabriel Yared and Cyrille Aufort’s beautiful score has brought the film full circle, and home to its epic roots.